Spjut, R. W. 2005. Relationships Between Plant Folklore and Antitumor Activity: An Historical Review. Sida 21(4): 2205–2241. The references for numbers 1, 2, and 4 below are unpublished materials that were cited in this publication. 1. Compilation of Plants Used As Anthelmintics and Their Comparison to Plants Screened for Antitumor Activity. Richard W. Spjut. 39 pages. Data summarized by Richard W. Spjut and Robert E. Perdue, Jr. in Plant Folklore: A Tool for Predicting Sources of Antitumor Activity, Cancer Treatment Reports 60(8): 60: 979–985 (1976). 2. Compilation of Plants Used as Fish, Arrow, Ordeal, and Homicidal Poisons, and Their Comparison to Plants Screened for Antitumor Activity. Richard W. Spjut. 32 pages. Data summarized by Richard W. Spjut and Robert E. Perdue, Jr. in Plant Folklore: A Tool for Predicting Sources of Antitumor Activity, Cancer Treatment Reports 60(8): 60: 979–985 (1976). References for Compilations on Plants Used As Anthelmintics and Plants Used As Fish, Arrow, Ordeal, and Homicidal Poisons (4 pages, 56 references). Compilations list species classified by family and genus in alphabetical order and show number of extracts tested for each species and the number of extracts that were active in the National Cancer Institute's Antitumor Screening Program (1960–1974). Each species name includes one or reference numbers, and synonyms if applicable. The references according to number are listed in a separate compilation above. The nomenclature was reviewed by Richard Spjut and Gudrun Christenson. An asterisk denotes a genus with one or more active species. Tumor systems of activity were lightly penciled sometime after the manuscripts were prepared. 3. Classification of Medical Terminology in Literature on Medicinal Plants. Draft Prepared by Richard Spjut, 1975. 9 pages, title page and covering memorandum to Robert E. Perdue, Jr., dated 4 Jan. 1977. Definitions for Medicinal Terminology in Literature on Medicinal Plants. Compiled by Richard Spjut, 1975. 4. USDA ARS. List of Plant Species Confirmed Active, Screened, 6 or More Times and GESOC. Revised Feb. 14, 1980. 33 p. Referred to as SLOP for Species Low on Priority, cited by Spjut in Economic Botany, 1985. 5. USDA ARS. Some Medicinal Plants That May be Sampled in Western United States. R. Spjut to A. S. Barclay, March 27, 1978. 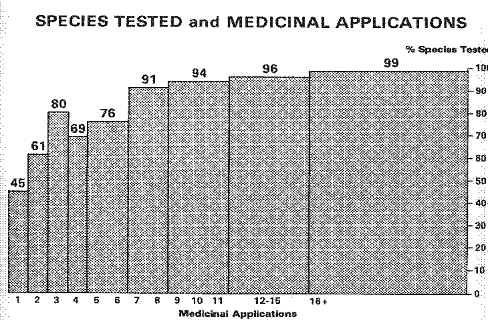 Percent of species screened by the NCI according to the number of different medicinal applications reported for 808 species in Quisumbing (1951) Medicinal Plants of the Philippines. The species reported by Quisumbing (1951) were classified according the number of different medicinal uses indicated for each species, and then compared to the NCI records to determine which had been tested for antitumor activity. Of those listed to have only one specific medicinal application, 45% were tested, of those species recorded with two medicinal applications, 61% had been tested, 80% for three medicinal applications, increasing to 99% for those species reported with 16 or more different medicinal applications. In essence the more widely distributed a species the more likely it is to get reported for a medicinal use, and hence more likely to be collected for the NCI screen. Data were compiled by Spjut and presented at the Society for Economic Botany Meeting held in Baltimore, Maryland, 1975 (Spjut &Perdue 1976). The species tested were a product of a random acquisition program (see Spjut 1985). Despite the large percentages of The Philippine medicinal plants that were tested, almost none were collected from The Philippines. Most species were collected in Queensland (Australia), India, and East Africa. Therefore, the correlation shown here between species tested and numbers of medicinal uses in reality is a direct relationship to the geographical distribution of the species.